YOU know you are not at an Australian sporting event when a crowd of 78,000 people rises as one when its political leader strides to the microphone to make a speech and doesn't boo. Not only don't they boo, they actively cheer. But then again Vladimir Putin is not Malcolm Turnbull. There are important differences. Putin welcomed the world to Russia on Friday morning (EST) for the first game in the 2018 World Cup at Moscow's Luzhniki Stadium. In keeping with the Russia's ambition to change its international image through this World Cup, Putin urged visitors to "enjoy their stay in Russia, an open, hospitable and friendly country, and meet new friends - people with whom they share the same values." The official party included Vladimir Putin and FIFA boss Gianni Infantino. In essence to forget the stories the West likes to keep repeating. The interfering in US elections, the poisoning of its ex-spies in public places, the shooting down of passenger planes. The Russians do have something of a reputation for brutality, but it turns out they also have a merciful side. They kept the opening ceremony to a brisk 12 minutes, before the speeches started. And even they were pretty quick. Anyone who suffered through the Commonwealth Games closing ceremony on the Gold Coast would have wept in appreciation. Still, Russia did inflict four songs by Robbie Williams on the captive audience, so while it gave with one hand it took with the other. But Robbie only does the big sporting events, as he proved by being the headline act at this year's V8 race around the streets of Adelaide. It couldn’t have been a better start for Russia. He also found the time to flip the bird at a TV camera. Why? Who knows. He's Robbie Williams, just a mad 44-year-old teenage rebel. 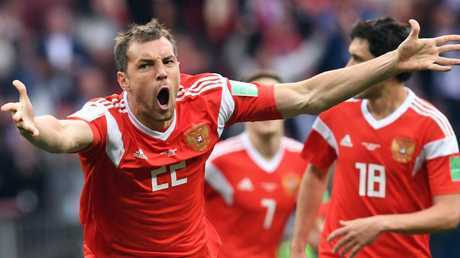 The game itself was a much-needed triumph for Russia. It won 5-0. Sure, you could have pulled 11 people from the crowd, given them boots and a shirt and they would have been an improvement on Saudi Arabia. When someone does the rankings of the worst World Cup teams of all time the Saudis will top the list. It's marginally worrying they finished above Australia during the qualifying phase. 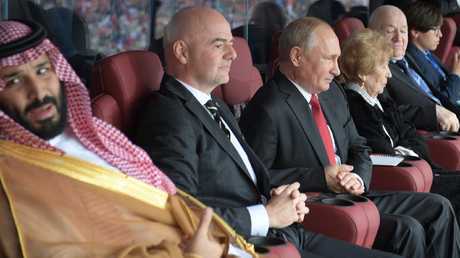 Putin tried his best to look humble sitting one seat from the Crown Prince of Saudi Arabia Mohammad Bin Salman Al Saud, offering up a shrug of the shoulders when Russia scored its first goal. But Putin doesn't really do humble. The belting added a party atmosphere to proceedings. The pro-Russian 78,000 crowd would erupt into its favourite "RAA-Ce-A'' chant at regular intervals. What it lacked in imagination, it made up for in volume. 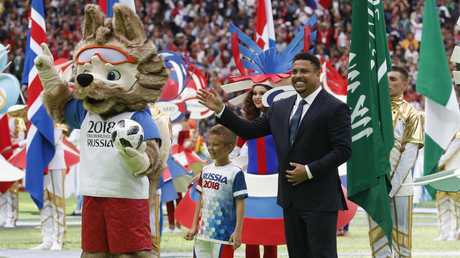 Brazil legend Ronaldo was part of the ceremony. The pre-game national anthem was sung with a nationalistic fervour you don't hear before an AFL or NRL grand final. But even before it all kicked off there was a happy, relaxed atmosphere outside the stadium. A kaleidoscope of colour and movement as fans of all types and persuasions hyped themselves up for the start of the globe's biggest sporting carnival. Russians fans who hadn't been seen all week were suddenly plentiful on Moscow's metro system. Packed into carriages, Russians of all ages in face paint and national colours, approaching the famous old stadium more in hope than any expectation their team will make any meaningful impact on the tournament. The entrance to the grand old stadium is dominated by a giant statue of the founder of the Soviet Union, Vladimir Ilyich Lenin, the eternal left winger. The arena behind him used to bear his name and it wasn't hard to ponder what he would have made of the cavalcade of capitalism at his feet. Giant western brands such as Budweiser, McDonald's and Coca-Cola were all on display and the patient public endured long lines to partake of the goods on offer. Most surprisingly there were even people prepared to wait to buy zero alcohol Budweiser at 350 roubles a pop ($7). Raising the surprising idea that people were buying Budweiser just for the taste. Fears of terrorism and hooliganism seemed far away for the moment. Perhaps just parked for the night, perhaps for the rest of the tournament. The security forces weren't shy letting themselves be known. Multitudes were parked at the trains stations, more on the way to the stadium and even more inside. So that's one game down and Australia to play Saturday. The World Cup has arrived. 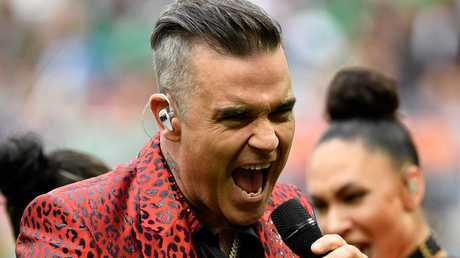 Robbie Williams belts out a tune at the opening ceremony. 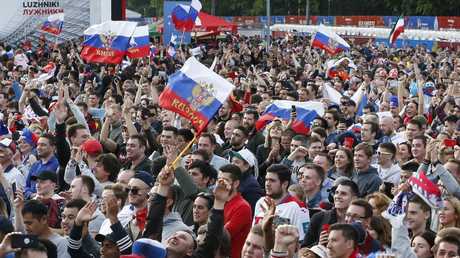 Russia fans came out in force to watch their team in the opener.